Standard - $17.99 Only 3 left! In the history of the universe, have you ever heard anyone say, “Man, being a werewolf sounds like it would be way uncool”?! Nope! That’s because the radicalness of morphing into a ferocious wolf that can run at lightening speed translates into any language! And we’re gonna let you in on a little secret: The transformation into a wild, lunar-driven beast always starts with the feet! That foot skin becomes leathery, those giant claws start bursting out where those toes used to be, and fur shoots out of the ankles, and you know you’re in trouble! 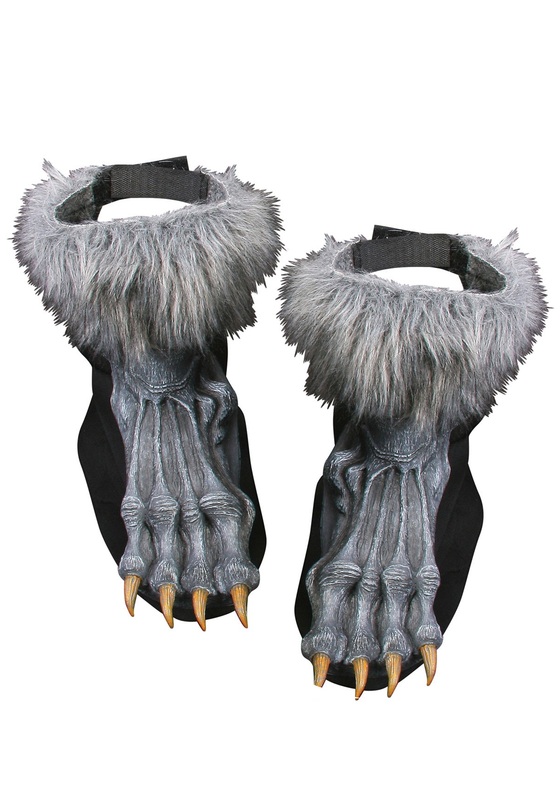 So if you’re going as a werewolf this Halloween, do the legend right with these Silver Werewolf Shoe Covers! The molded vinyl tops are shaped like wolf feet with a foam cover underneath. You can secure them with Velcro straps at the heels and an elastic band under the shoe. Faux fur surrounds the ankles, and when all is said and done, they measure 9” from the front of the ankle to the tip of the toe. So get these Silver Werewolf Shoe Covers this Halloween, and you’ll be taking a step in the right direction to becoming the most terrifying, badass mystical creature this side of the dark moon!